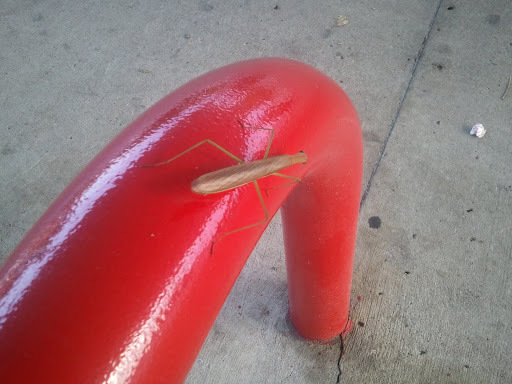 praying mantis – jen wewers, m.div. Yesterday I did something I have not done for ages. I meditated. It’s all part of that new schedule of mine. My original plan was to come home and walk the dog for thirty minutes. Some days I really want to be Ward Cleaver when I come home from work, you know the whole putting my feet up, reading the paper and having a beverage of my choice. Instead I come home and immediately transition into June. Seriously? In our house, gender transition happens in minutes not days. Sorry Chaz Bono….you got nothing on me! Clearly my attempt to walk the dog upon post-work home entry is not going to work. BUT I can get 15 minutes. So yesterday, before the frontal assault of neediness commenced, I said, “WAIT…before any of you say anything I am taking 15 minutes upstairs in the zendo…. by myself to meditate. And dear ones, for fifteen glorious perfect minutes I sat. Dinner was a joy, the evening seemed to unfold without any drama, I felt peaceful and present. And to get there? It only took 15 minutes. So, on my drive to work today, I was listening to one of my gurus, Eckhart Tolle, (another part of my schedule – listen to inspiring, encouraging teachers during my 40 minute morning commute) I stopped to get gas. As I sat there pumping, I saw a huge green praying mantis on the ridge of a red pole. I can’t remember how long it has been since I saw one. My spirituality does not take much to activate. God (and my mom) meet me where I am and encourage me to keep taking time for myself. Those 15 minutes of practicing mindfulness AND the sheer act of taking care of myself and asking everyone else to pause so I could – was all I needed to feel more connected to myself, my family, my life and Spirit. And to that, can I get an AMEN?